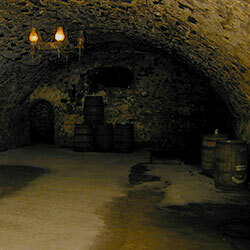 Reputed to be the oldest original operating brewery building in Ontario, Neustadt Springs Brewery sits above the original crystal springs which still flows in the caverns beneath the brewery and is solely used in the production of their beer. Every fall the artists of the Autumn Leaves Studio Tour invite the public into their homes and studios. This year on October 2, 3 and 4 explore the diversity of each artist’s creative process and their amazing selection of artworks. The range of mediums include; glass, watercolours, pottery and ceramics, acrylics and oils, fiber art, wood, preserves, print and metal. After 10 years designing and producing functional pottery, Richard’s work continues to evolve. With the home & garden in mind, Richard creates a fresh collection of richly decorated pieces. Richard strives to balance every day use, timeless sensibility with contemporary shapes. After more than 3 decades at his craft, Gary McLaughlin is bringing more confidence, skill, humor, and insight to his paintings than ever before. His accomplishments include magazine and book covers, collector plates and limited edition sports prints. 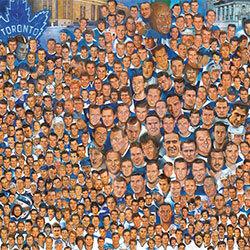 Corporate clients, including Coca Cola, Tim Horton's, the Canadian Broadcast Corporation (CBC) and Maple Leaf Gardens have featured his artwork on product merchandise and print ads. 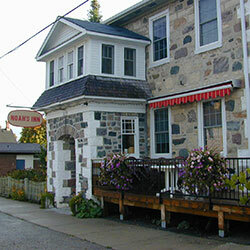 Noah's Inn is a casual fine dining restaurant in Neustadt, Ontario. Whether you linger over a cappuccino with your morning paper; savour soup and salad for lunch, or spend an evening enjoying one of their outstanding entrées, you are sure to have a memorable experience at Noah's Inn. 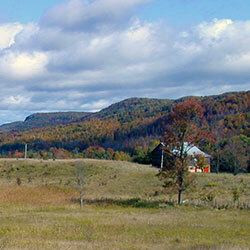 In the middle of nature’s haven overlooking a breath taking view, come see this year’s nature related works of art. See a variety of glass techniques in garden, suncatchers, windows, cabinets to 3D pieces. Demonstrations. Family run Bistro, serving locally grown & produced food. One of the 9 sections of the Bruce Trail, the Beaver Valley section extends from Craigleith to Blantyre covering, 113.1 km of main trail plus an additional 50 km of side trails. 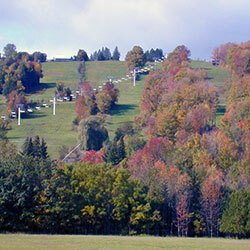 It takes hikers across diverse landscapes from the top of the escarpment with grand views of Nottawasaga Bay and of the Beaver Valley, through fields and forests, by creeks and waterfalls accompanied by the flora of the different seasons or the colourful foliage of fall. For over fifty years, Grandma Lambe's has been serving the Southern Georgian Bay area with friendly, old fashioned hospitality and the best home baking anywhere! Visitors to the area love the unhurried pace of a bygone era and the knowledgeable assistance of Grandma Lambe, her family, and the staff at the stores. Open all year round, the Almond Family works together to bring you all the best produce, gifts, home baking and preserves that Grey County has to offer. 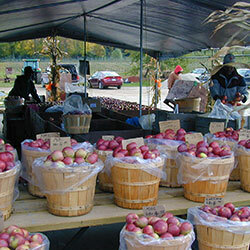 The main attraction at Almond's Orchard and Farm Market are the APPLES. Meaford’s biggest claim to fame is scarecrows. 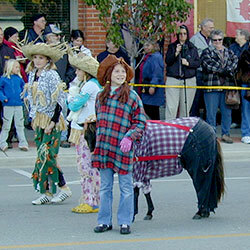 Thousands of people attend the Scarecrow Invasion's Friday evening Parade & Family Festival in Market Square. Children and adults love to dress up as scarecrows. As an added attraction, many carry stuffed and manufactured varieties of the cute figures during Friday evening's festivities. Weekend activities include harvests dinners, special scarecrow exhibits and contests, pancake breakfasts, a hay maze obstacle course, apple-peeling contest and entertainment for the entire family. Both Scarecrow Invasion and the popular Apple Harvest Craft show are held annual over the first weekend in October. 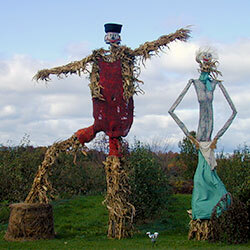 Scarecrows are usually kept on display until after Thanksgiving weekend. The 100 Mile Market in Meaford is a small grocery store bringing together local producers with local consumers. They were inspired by the book 100-Mile Diet, and by the local consumers' call for continuation into the winter months of the goods offered at the Meaford Municipal Farmers' Market founded in the summer of 2007. Your 3-hour adventure begins with gear outfitting (all provided for you) and introductions to your guides. 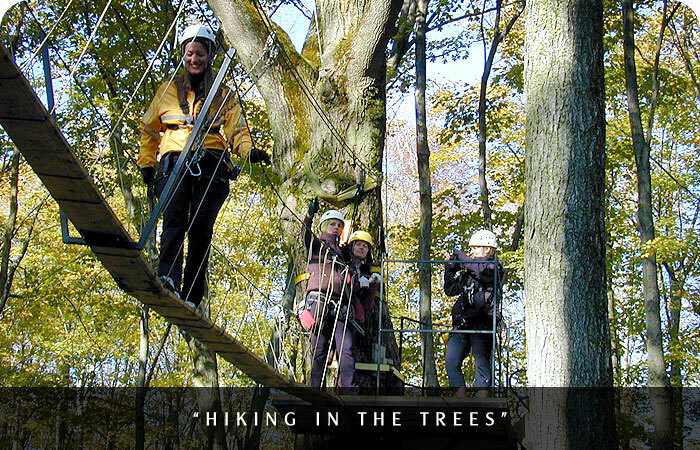 You will then take a short hike to our 410 foot suspension bridge overlooking a 10 000 square kilometer view of Collingwood and Georgian Bay. A tractor and wagon ride through the forest will give you a glimpse of the unique ecology of the Niagara Escarpment before you journey up into the trees. 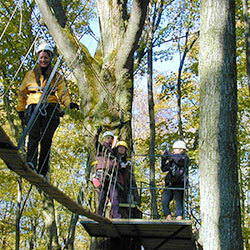 Your treetop walk will take you 600 meters across 10 inch wide bridges suspended as close to the treetops as possible. This exciting Blue Mountain eatery in the upscale Westin Trillium House is custom-built for full-service mountain dining, as well as some seriously indulgent culinary experiences. The menu brings the “100 Mile Diet” to life through a large network of local farmers and food producers, allowing Rocky Raccoon Café to serve some of the freshest and best foods available in Grey and Bruce Counties. Local fish, elk, bison, beef, lamb, and chicken, plus organic vegetables, cheeses, wines, and many others provide endless inspiration. The intention behind every dish served at Rocky Raccoon Café is ‘local and living’, a combined effort with local food producers to fill a desire to nourish both body and spirit. Global market fresh cuisine with a mediterranean ambience overlooking Thornbury harbour and Georgian Bay.